My Aunt Rita is a wonderful cook with a particular passion towards baking. We often exchange recipes. When I need help for some event where the presence of the guests is the most numerous, we often collaborate. A short time ago she was talking to me about Luca Montersino, a pastry chef from Piedmont, whose desserts she had tried and watches his TV show. I do not know him, but I was intrigued by the passionate way of my Aunt speaks of his recipes, I bought the book “Le Dolci Tentazioni” published by Rizzoli and Luca Montersino and I read it as one reads a novel. I liked the recipes and I decided to experiment with his truffles to which I added the variant of the Grand Marnier. 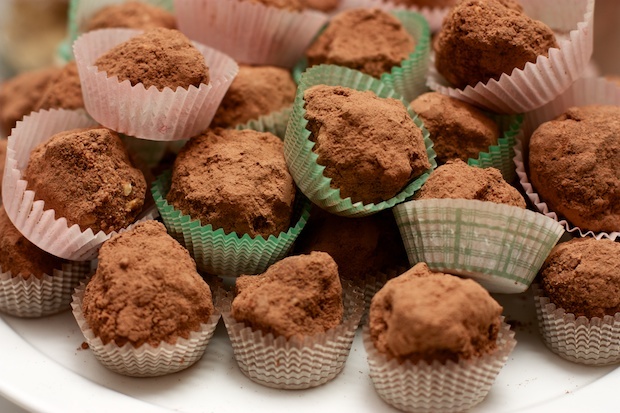 These truffles are easy to make and very good. Even my office colleagues were able to appreciate them, this was the best way to get them away from my husband and prevent him from having indigestion. They are nice to also prepare for the feast of St. Valentine. Put them in a box is all tied with a small bow of red satin, and you will win over hearts and taste buds. With the indicated doses you will make 40 truffles. If you want, you can cut the doses in half. Break down the cookies into a powder. Chop the hazelnuts in a fairly coarse flour. In a saucepan, which can be inserted over a pot of boiling water (bain-marie), add the dark chocolate and milk chocolate hazelnut paste and butter. Let the components melt blending it all with a spoon. In a bowl, pour the powder of cookies, hazelnut flour and powdered sugar. Mix everything together, pour the mixture of chocolate and Grand Marnier. With your hands knead quickly. If the dough becomes too soft, leave the mixture in the fridge for an hour covered with plastic wrap. Add the bitter cocoa into a shallow dish. 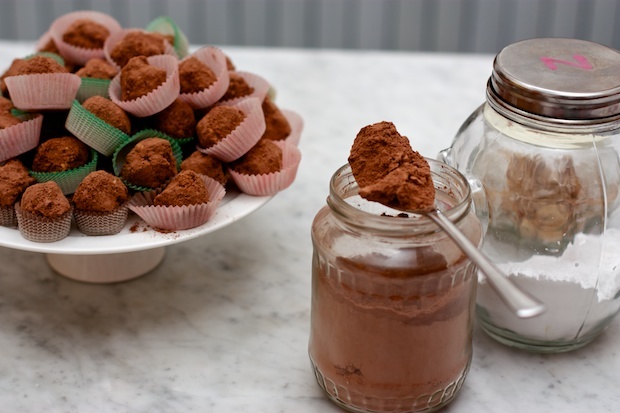 Make irregular balls “truffles” from the hazelnut mixture and turn them over quickly in the cocoa powder. Place the truffles in paper cups.